The future arrived faster than we—or at least I—thought it would. 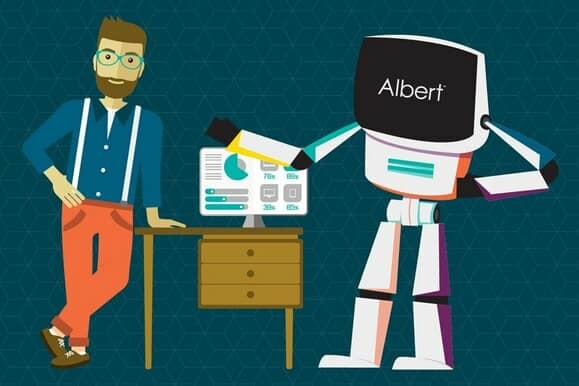 Check out Adgorithm’s Artificial Intelligence named Albert, billed as ‘the first Artificial Intelligence marketing platform for the enterprise’. At first I though that the main advantage it gives you is a (much) faster way to optimize your paid campaigns. But it also addresses targeting and ‘cross-channel execution’ and if it also can optimize more efficiently and quickly than most people can then your process is obviously improved. Once you set up your campaigns optimization is the challenge, so this is potentially huge. The basic idea here is that it takes many iterations to really dial in a campaign. Hardly any paid ad campaign has positive ROI out of the gate, and even if it is positive you still have to figure-you have to expect—that you can improve the performance of everything from your targeting to your headlines, images, ad copy, etc. Also, it’s imperative that you make use of effective tools like Facebook custom audiences and Facebook lookalike audiences…attending to all these different campaigns with the diligence your ad spend deserves adds up to a lot of time. Also, a lot of what you are doing, once you have statistical significance for one variable over another, is making further tweaks to what is working, in search of continued improvements in ROI or whatever your relevant KPIs are. There is a fair bit of guesswork here, as you’re always trying new things. As a guy who’s spent a ton of time optimizing campaigns I can affirm that you can use all the help you can get. I’ll bet affiliate marketers running big campaigns are already testing this technology against their current processes. This is about more than making marketers’ jobs easier–if one company’s 2017 version of this kind of tech can help squeeze a few percent more positive ROI out of a scaled campaign, bigger affiliates can’t ignore it. Just imagine five years from now. Here’s a detailed case study involving Harley Davidson of NYC–this tech changes that game.